Be the Inspiration. Share your Ideas to over 80 community leaders and guests. Rotary is a global network of 1.2 million neighbours, friends, leaders, and problem-solvers who come together to make positive, lasting change in communities at home and abroad. Rotary Club of Victoria-Harbourside was chartered in 1980 with 38 members. Today, meetings have around 60 - 80 attend each week. if you'd like to address our membership, we'd love to hear from you. Our speakers generally speak for around 20 minutes. Subjects include news happenings, community concerns and other ideas that are of interest to our membership. We like to think "If our community is talking about it, it would be great to have an expert discuss it at our club." While we cannot accommodate every request to speak to our group, we will respond to your query. Email our Speaker Chair Cheryl Thomas. Photo: Recently, the 30th Lieutenant Governor of British Columbia, The Honourable Janet Austin, OBC, addressed Rotarians. 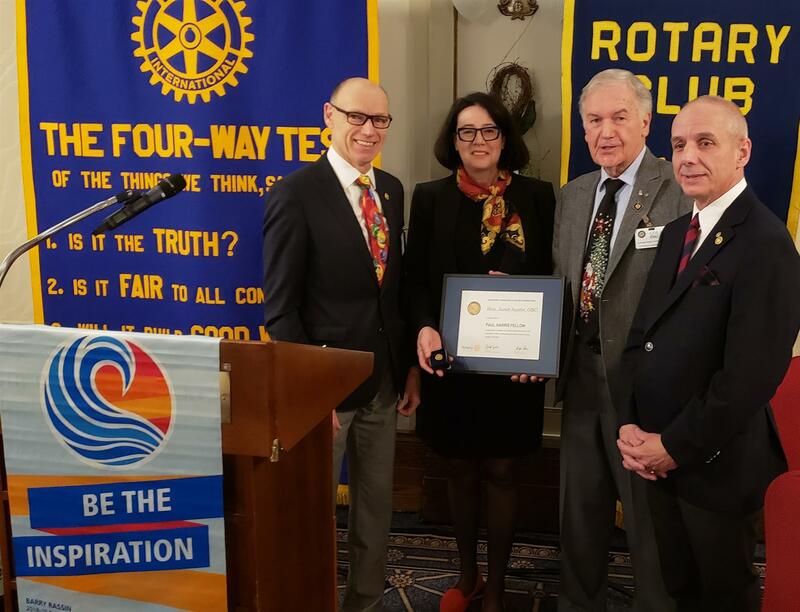 Afterwards the Club presented her with an honourary Paul Harris Fellowship, a recognition of her contributions to our province.